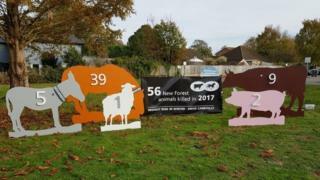 Life-size animal silhouettes are being placed around the New Forest to help reduce the annual spike in road deaths after the clocks go back. The signs display the number of ponies, cattle, donkeys, pigs and sheep killed last year – in total 56 animals. The national park authority said the two months after the clocks change are the most dangerous of the year as the evenings become darker. So far 49 animals have died between January and August this year. The figures, from the the Verderers of the New Forest, showed that was 10 more than in the same period last year, although the total number of deaths is 40% lower than a decade ago, the park authority said. Commoners – the families who own the animals that graze the forest – have got together to produce the signs which will be placed in local towns and villages throughout the winter. James Young, whose pony Brock Brocade was killed by a hit-and-run driver, said: “This is the most worrying time of year for every family making the effort to keep the forest properly grazed. “Pure-bred New Forest ponies like Brock Brocade are now a rare breed. Every one matters to its owners and to the forest. “No pony deserves to be left all night to suffer like Brocade in an unreported hit-and-run.